At last a book has been written that sings the praises of the ubiquitous 19th century mountain canary  the lonely burro  although often during full-moon nights, burros did their own singing, and not to the amusement of local miners seeking a good nights rest. Finally, two competent and well-published authors have set the record straight about the lowly jackass and how the mighty skyscrapers on Denvers 16th Street owe their height to thousands of pack burros who brought in supplies, carried out ore and built our fair state. Though hundreds of mining camps, which in the words of Wallace Stegner went out like blown matches, can also be attributed to the burros short but broad backs, certainly the urban success of Colorado can be traced to those first pack trains that hauled the mountains wealth down from high hills and into centers of commerce. 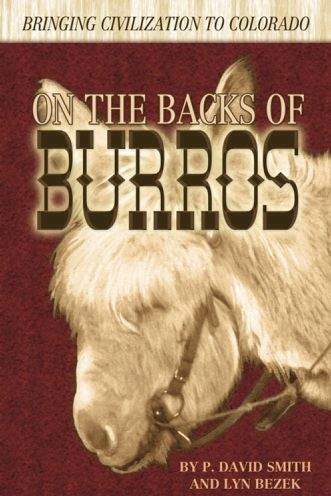 With black-and-white photos, many of them historic, and 10 chapters, historian P. David Smith and childrens author Lyn Bezek have collaborated on an ode to burros including an appendix with the complete text of the Wild and Free-roaming Horses and Burros Act of 1971 (Public Law 92-195) and rules for pack burro racing, just in case readers want to really test their patience. The authors also located drawings of burros from publications like Harpers Weekly and Frank Leslies Illustrated Newspaper. On the Backs of Burros even contains poems about the shaggy, long-eared beasts. Prefers to eat old skirts. Fill him with delight. (Page 119). Burros could eat and drink just about anything, which made them a favorite of lonely prospectors who shared flapjacks with their beasts of burden. Quiet, submissive and good listeners, burros can live for more than 40 years, and they comforted many a prospector down on his luck and low on grub. This is a rather extraordinary book. Its Colorado mining history from the perspective of a jackass. The authors have a good history of the Spanish use of burros in the American Southwest, and for a general reading audience, the volume serves as a preliminary guide to prospecting. There are tales of mistreating burros, but also stories about the states best-known burros like Prunes, and burro packers like Olga Little from the La Plata Mountains near Durango. Burros are shown hauling timbers, cables, ore sacks and numerous little children, all trying to hang on between the ears and the tail. The preferred mode of equine conveyance for women and toddlers, burros practiced patience almost to a fault. Getting them to move could take most of a day, and getting them to stop could take all night. Yet the hardy animals endeared themselves to several generations of Coloradans and acted not only as rugged pack animals, but also as large, furry watch dogs, ready to guard sheep or alert prospectors of incoming visitors and flash floods. Considering the mines across the state, and especially in the high vastness of the San Juans above 11,000 feet, its humbling to note that every mining timber, every stove, winch, ore car and piece of rail, was hauled in by burros before wagon roads and later tramlines could be established. Folk tales include prospectors getting so angry at their shaggy companions that they reached down to pelt them with a sharp stone only to find the rich ore body theyd been searching for all their lives. With names like Blue, Bummer, Floppy, Shorty, Sweetie and Plain Jane, burros had almost every handle a prospector could invent, and in turn, burros left their mark across the Western Slope landscape with a variety of U.S. Forest Service place names like Burro Bridge, Burro Creek, Jackass Flats and Burrow (burro) Park near Lake City. Sure-footed, more trustworthy than a mule or a horse, a burro could haul just about anything, and did, if it were packed properly and the load tied with the right Diamond-hitch knots and a hard knee into the tight little belly to get the animal to quit blowing before the cinch tightened. J.H. Lewis explained: rHis slowness and sureness of movement enable (the burro) to go up and over the loftiest mountain summits, the rockiest curves, and on the narrowest of trails. He plods sleepily along on the very edge of the most frightful precipice without once losing his head or making a single mistake. (Page 15). Beginning with Native American use of burros to haul firewood into Pueblo villages, prospectors used burros to carry their vital mining supplies and food. Once a vein proved profitable, whole armies of burros brought in materials to build boarding houses, tram houses and cook shacks. Burros also pulled the ore carts deep into the mines, and some donkeys almost went blind because they stayed in the dark so long. Most prospectors abandoned their burros when, fed up with hard work and few pay days, men left lofty summits and narrow mountain trails for more stable employment at lower elevations. Set loose, burros wandered in the mountains and eventually worked their way into mountain towns where they became adept at opening gates, eating petunias, carrots, sunflowers and other garden truck, nuzzling oat bags and gnawing wooden porch rails. The long-eared donkeys became continuous pests, but small towns loved them and children could easily catch a ride just by claiming an untied burro. Burros bridged the gap between Colorado Territory as a haven for prospectors and the State of Colorado as a tourist mecca. Thousands of burro photos can be found in archives and family albums, and well-dressed sightseers and tourists often posed with local jackasses  burros that is. After the 1930s, the burro population declined and fell precipitously in the postwar years. In 1971 Congress passed the Wild and Free-roaming Horses and Burros Act to protect the animals, though serious overgrazing resulted in their removal from the Grand Canyon and other locales. Today, wild horses, which are really feral horses set loose, pose a serious threat to Western public land ecosystems, but burro populations are smaller. The BLM has an innovative adopt-a-burro program but many animals go unclaimed, hence the Donkey Rescue chapter at the end of the book. Read On the Backs of Burros and realize that being called a jackass is actually a term of endearment ... or should be. Andrew Gulliford is a professor of Southwest Studies and history at Fort Lewis College. Reach him at gulliford_a@fortlewis.edu. On the Backs of Burros: Bringing Civilization to Colorado by P. David Smith and Lyn Bezek, Lake City: Western Reflections Publishing Co., 288 pages, $16.95.